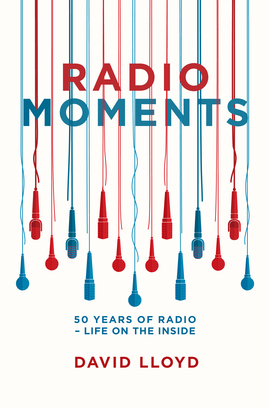 Radio Moments : How does Ofcom feel the BBC is doing? How does Ofcom feel the BBC is doing? The question of BBC regulation is always going to be a sticky one. As a respected, independent regulator, Ofcom is probably the best alternative, not least at a time the BBC is under siege on various matters. Indeed, to be able to cite an independent arbiter is likely better than a tin hat for the Corporation itself. Ofcom must now 'hold the BBC to account on behalf of audiences by providing robust, fair and independent regulation'. Performance measures are duly set and Ofcom is required to publish a report each year. Ofcom must report too on the BBC’s performance against the measures stipulated in the Operating Licence. So – the trusty Trust has gone. That body which called a halt to the closure of 6 Music and BBC local radio networking has disappeared in a puff of smoke. The BBC does have a Board, though, which is charged with delivering on the Charter, but my experience of that is that if you write to complain to headmaster about the geography teacher, your letter will be given to the geography teacher to reply. Overall, Ofcom concludes the BBC is generally delivering on its remit, but identifies four areas where it needs to go further - namely: transparency into its working practices; maintaining its commitment to original UK programmes; engaging young people; and continuing to improve how it represents and portrays the whole of UK society. Given this is the first end of term report from the new teacher, let us examine what it says about BBC radio. It’s not the easiest of tasks, given the report is legitimately multi-platform - as indeed are consumers these days - but given the operating licences do offer some specific demands of radio services. 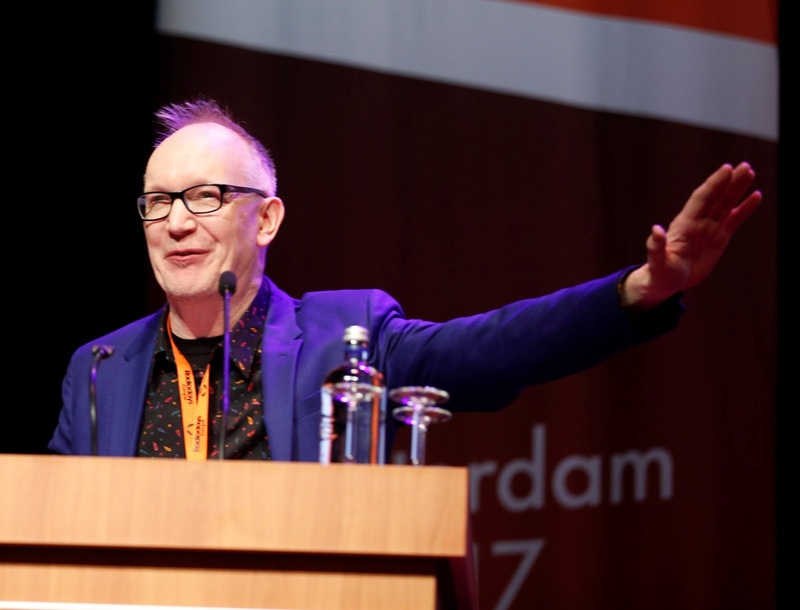 What conclusions are reached – and what of radio’s profile? Radio merits an early mention – with the breakfast show on BBC Radio 2 trumpeted as “the most listened-to radio programme in the UK”. Radio 4’s Today programme is praised too for its 7m audience. In fact, more people are satisfied with radio and online than TV. In spite of the silliness on Twitter, satisfaction with the BBC is generally high – and people say about it what you would expect. Listeners from a white background, those in AB socio-economic groups and older people (aged 65+) are more satisfied, and those aged 25-34 and people from minority ethnic backgrounds are less satisfied. Distinctive output is praised – and there is a suggestion that the BBC Asian network and Radio 4 have no "directly comparable provider". I’m not sure life is quite as simple as that. 77% of BBC radio listeners rate the BBC highly for its different types of radio station. In offering "something that other providers did not", two of the highest-rated stations are BBC 6 Music (88% rating it highly) and BBC Radio 4 (86%).135 Two-thirds of BBC Radio 1 listeners (66%) rated it highly for providing something that other providers do not. 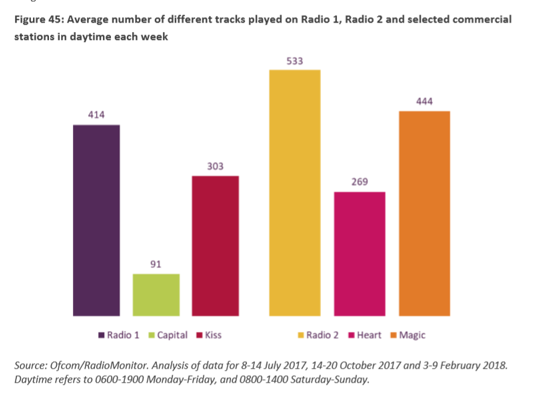 When asked how satisfied they were overall with BBC radio, 74% of listeners across BBC stations rated it highly, although listeners to Magic (81%) and Smooth (80%) rated these individual stations higher. The threat to younger audiences is highlighted, as is the fact that “younger people are also more likely to listen to commercial, rather than BBC, radio stations”. Indeed, national commercial radio services now reach 42% of 15-24 year-olds, up from 38% ten years ago, in contrast to other radio stations which have seen their young audiences decrease. “Significant steps” forward from the BBC are demanded by Ofcom in this area, including for radio. TV continues to be the most-used platform for news overall – with "the internet" now more widely used than radio or print newspapers. 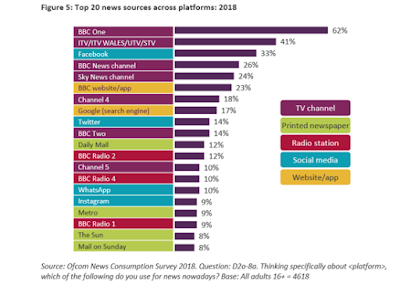 BBC network radio reaches over a third of adults with its news and current affairs programmes - with such programmes across Radio 1, Radio 2, Radio 4 and 5 live listened to by 21 million adults, more than a third (36%) of all UK adults – a reach figure stable over time. Almost six in ten (57%) of BBC radio listeners listen to one or more of these news programmes. 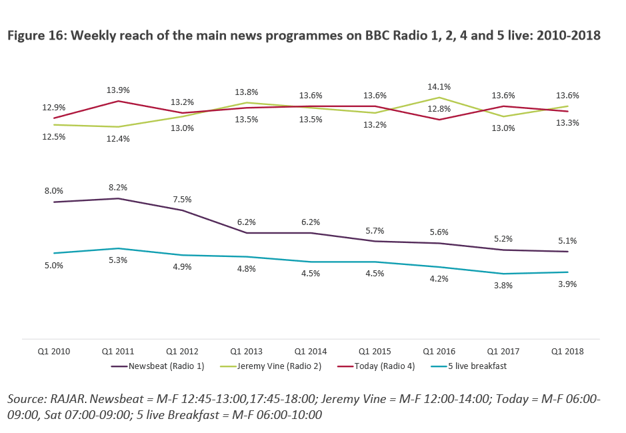 The reach of both The Jeremy Vine Show and the Today programme have remained relatively stable over time, although Radio 1’s Newsbeat audience has decreased by 32% since 2010, greater than the decrease in the station’s reach (-19%). 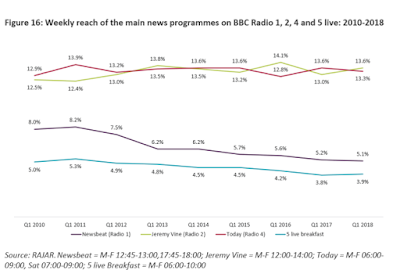 The weekly reach of the 5 live breakfast show also decreased between 2010 and 2018 (-18%), in line with the decrease to the station overall. A footnote confirms the Today programme did show a decrease in listeners in Q2 2018 (as, of course, did the Q3 result). Ofcom pledges to review “news and current affairs output and how it can continue to be a trusted destination for audiences”. This is a critical issue, and I believe the BBC – and indeed Ofcom - can also do more here to explain how newsrooms work and make journalism more transparent. Ofcom recognises the changing radio landscape and the move to digital – and salutes the growth of podcasting, whilst sensibly placing its scale in context. The new ‘BBC Sounds app’ will give “audiences easier access to (its) audio content”. Ofcom concludes the BBC complied with its requirements and proudly says “we have increased the proportion of ‘new music’ that Radio 1 and Radio 2 must play during daytime”. Radio 1 is said to have played a higher proportion of music by UK artists compared to comparable stations. On average, almost half of Radio 1’s daytime music output was from UK artists (49%), compared with 47% for Capital and 43% for Kiss. On average, almost half of the music tracks Radio 2 played in daytime were by UK artists (48%). (37% for Heart and 48% for Magic). Radio 1 and 1 Xtra achieved their required one hour a day of news and the frightening hurdle of “bulletins at regular times”. Radio 2 and 3 managed to have regular bulletins too, the latter managing to exceed its mandatory 17 hours a week of news and current affairs programming, with three in peak. Cheers, Jeremy. Radio 4 did its Parliament dutifully; 5 Live did its election coverage; 6 Music delivered its six hours of news; BBC Asian Network did its compulsory 24 hours of news; Radio Cymru, Wales Ulster and Foyle achieved their news volume; and Radio Scotland exceeded its 50 hours – and offered the required regional and community opt outs. As the tick list continued, Ofcom nodded that Radio Scotland, nan Gàidheal, Cymru, Wales, Ulster and Foyle had managed to “broadcast content and music of particular relevance” to their home country. That must have been a struggle. Ofcom suggests that BBC Radio nan Gàidheal, of which news at specific times is required, is doing what it was doing under the Trust and is "considering future news provision”. If I were the chap with the handcuffs in court, I’d be unsure whether this was a guilty or not guilty verdict. Radio 1 duly blasted out its 60 hours of specialist music. When the operating licence was released, I was critical that it allowed BBC local radio to just about do what it liked – whether pared down and networked, as it nearly was, or expanded and targeted universally, as it now has been. It’s no surprise therefore than BBC local radio has indeed managed the Herculean challenge of disseminating “News and information of particular relevance to the area and communities it serves at intervals throughout the day”; and “content of particular relevance to the area and communities it serves”. It has exceeded the 95 hours of local programming required – giving 109.9 hours. Mind you, the licence means some content may be shared and still deemed local. Overall, BBC radio listeners are more likely to be older, in an ABC1 socio-economic group and from a white background. 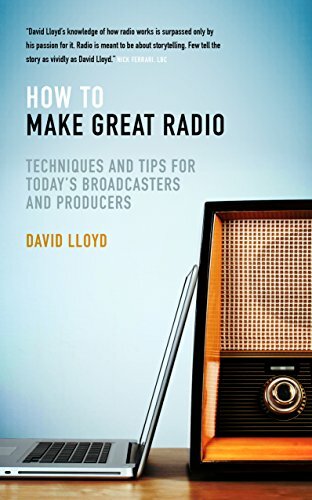 Across BBC radio, Ofcom suggests that factual content was broadcast mainly outside peak listening hours – but reminds us that there is no formal learning output required specifically on BBC radio. Not too many complaints about the BBC have been dealt with by Ofcom, although the figure does include over 1600 about bias. The relatively small figure owes something to the ‘BBC First’ policy, where angry folk must exhaust the BBC complaints before they bother Ofcom. 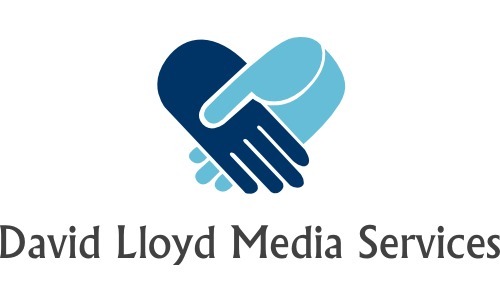 It still puzzles me that commercial radio is not afforded a similar approach, not least because commercial stations’ online public files mean complainants can readily access a real human being with a single click, as opposed to being caught up in the BBC’s complaints mangle where one loses the will to live. 15 clicks of the BBC complaints process are needed before you are permitted to vent your spleen – and that’s if you know your way round. It surely would not be a challenge to have the word ‘complain’ on the home page and the home page of each BBC radio station. The famous upheld Radio 4 complaint on climate change is detailed. The paranoid frequently cite this instance as evidence of the BBC’s falling standards. I cite this lonely missive as evidence the system is working. As we know from the annual report, spend on BBC radio output declined by 13% in real terms from 2010/11 to 2017/18, when it stood at £480m. There was a more modest 0.5% year-on-year decline from 2016/17 in real terms. So, taking the report as a whole, how well is BBC radio doing? And how has Ofcom fared in conducting this exercise? Specific performance targets are few - and in several cases the levels required suggest this would always be an egg and spoon race for the BBC rather than hurdles. As an analysis of how well the BBC is meeting its Charter, it's maybe a decent piece of academic work. As far as getting to the heart of what listeners really think about their radio stations, it perhaps does not uncover listeners' real worries and delights in the way we know diligent internal qualitative research does when inspired by canny programmers. Does it really assess how the Corporation is serving a listener in their semi in Newcastle, it feels maybe not. Did the BBC need Ofcom to tell them that radio has a youth audience challenge? Probably not. Is there a risk that the leap to young audiences now demanded so publicly may be randomly applied to Corporation output with which listeners are currently very happy. Probably so. Does the report say what maybe should be said about the benefits of a more confident and visible public BBC leadership? I feel both listeners and employees would value that. Maybe this is all to be expected when you ask a regulator to judge an apple pie contest. But it's still probably the best option there is - we just need to make sure that what is expected of the BBC is always well-defined.